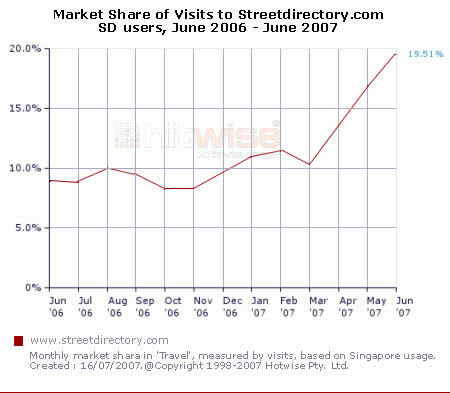 Visits to Streetdirectory.com, an online mapping and travel guide, increased by 87% between the months of March 2007 and June 2007 by Singapore Internet users. In a similar trend, Bezurk, a travel search engine for Asia Pacific markets, reached an 8-month high week ending 7 July, 2007, ranking at 9th position within the Travel industry. Streetdirectory.com has been the leading travel website in the Travel industry over a 24-month rolling period. The surge in visits to Streetdirectory.com, which offers 3D maps and business search features, indicates growing demand by Singapore consumers for online services that enhance local mobility. Bezurk.com allows users to compare deals across hundreds of travel websites, enabling direct bookings with Bezurk’s partners. The rise in Bezurk.com signals demand for more services enabling cost-effective regional travel. Search Engines and News and Media websites played an important role in visits to Streetdirectory.com and Bezurk respectively. 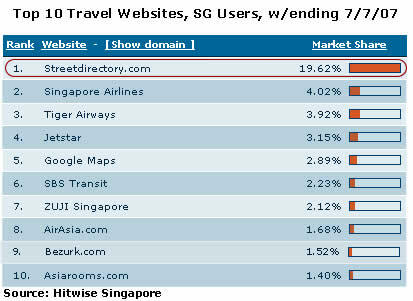 While Google Singapore referred the highest volume of traffic to Streetdirectory.com with 11.35% of visits for the week ending 17 July 2007, Today Online, a daily news website, was the biggest contributor of visits to Bezurk with 45.71% upstream traffic. Google Maps was the website most visited after Streetdirectory.com, indicating that users are also researching other mapping services. Lonely Planet Haystack was the top Travel website users visited after Bezurk, week ending 17 July 2007. As Lonely Planet Haystack offers accommodation recommendations, it indicates a desire by Singapore travelers to receive independent online advice for places to stay. Search data indicates that Singapore Internet users are likely to research local and regional areas, as opposed to long-haul destinations. Out of the 42,501 search terms that delivered visits to the Hitwise Destinations & Accommodation category, the top ten queries were, ’sentosa’, ’singapore zoo’, ‘genting’, ‘hotel’, ‘hotel 81', ‘downtown east’, ‘bintan’, ‘zoo’, ‘jurong bird park’ and ‘hotels in singapore’. Other destinations in the top 100 included ‘phuket’, ‘bangkok’, ‘malaysia’, ‘hong kong disneyland’, ‘bali’, ‘costa sands’ and ‘rasa sentosa’. Given the strong consumer interest in local and regional travel by Singapore Internet users, there is an opportunity for travel operators in other markets such as Australia and New Zealand to increase their share of search in the Singapore Destinations & Accommodation sector.